Your spouse and children under 21 can be included in your application with no extra investment requirement, so they will also receive permanent residency. Your and your spouse’s parents, as well as your unmarried children over 21 can receive a Long Term Visit Pass valid for 5 years. 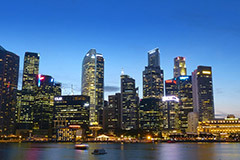 Eligible applicants must demonstrate significant business experience for the Singapore residency program, including audited financial statements for their company for the last three years. The must show an average yearly turnover of at least SGD 50 million (USD 35.8 million) for most industries, and at least SGD 200 million (USD 143.1 million) for real estate and construction-related activities. The application process is typically finished in under a year, provided the application documents are complete and the investments and required payments are made on time. You and your close family members will receive a permanent resident permit, valid for 5 years. The permit can be renewed for an additional 3 or 5 years depending on your business investment performance and the time of your physical residence in Singapore. You will be eligible to apply for Singaporean citizenship after 2 years of permanent residency. Note, however, that dual citizenship is strictly forbidden, so you will be asked to give up your existing passport. Once you receive your residence permit, you and your family members will be able to enter and re-enter Singapore an unlimited number of times. Should you decide to apply for Singaporean citizenship, you will receive one of the most valuable passports in the world, granting you visa-free travel to over 170 countries including the EU (Schengen), the USA, Canada, China and Australia. To obtain Singaporean permanent residency, you will be asked to invest SGD 2.5 million (USD 1.8 million) in a new business entity or expand an existing business in Singapore (from the group of business activities eligible for the program). Alternatively, you can invest the same amount in an approved fund, which in turn will make an investment in a Singaporean company. A non-refundable application fee of SGD 7,000 (USD 5,000) has to be paid at the beginning of the process.